Patricia devotes her practice to facilitating clients' successful navigation through life's transitions by concentrating on Elder Law, Guardianship Estates and Estate Planning. With a background in Social Work, she is a trained Elder Mediator and her law practice emphasizes the use of Mediation and Collaboration, as well as Litigation. A lifelong resident of Queens, Patricia earned a BS in Human Services from St. John's University then worked in Ozanam Hall of Queens. She left to raise her family and later earned a JD from City University of New York School of Law. 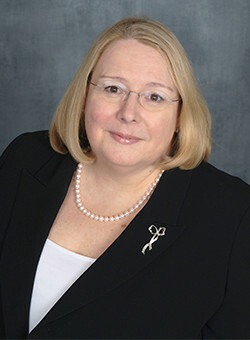 Licensed in New York and Connecticut, Patricia is also active in the NYSBA Dispute Resolution Section. She is a member of the NYSBA Elder Law Section and the NYSBA Trusts & Estates Sections. She is also a member of the Queens, Nassau and Suffolk County Bar Associations, as well as a member of the AARP Legal Services Network and the National Guardianship Association. Locally, she serves on the Board of Directors of the Center for Woman of New York and on the Board of Directors of the Columbian Lawyer’s Association of Queens County. With extensive experience in Guardianship matters Patricia is often called to serve in Court appointed roles as an Article 81 Guardian, Court Evaluator and Counsel to the Allegedly Incapacitated Person. She has been entrusted to act as the SNT Trustee for several individuals. Patricia has been appointed by the Appellate Division of the Second Dept. to serve as a Court Examiner to oversee Guardianships in Queens County. She participates in the International Guardianship Network and lectures on Aging Issues to community groups and attorneys. She is a mother of two young adults: a daughter and son. Her other “children” are two delightful Shiba Inu dogs and a North Shore “rescue” cat named Inky.